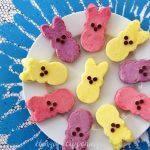 Sweet little cheesecake Peeps flavored and colored using fruit purees. Fill a 9x13 baking dish 1/2 way with water. Set dish on bottom rack in oven. Arrange other rack in the middle of the oven. Beat cream cheese on medium speed using an electric mixer until smooth. Divide the cheesecake batter equally among three bowls. Stir raspberry puree into one bowl of batter and blueberry puree into another. In the final bowl add the lemon juice, lemon zest, and egg yolk. Fill four Peeps cavities in the silicone mold with each color of cheesecake batter. Bake the cheesecake Peeps for 14 minutes. Remove and allow to cool at room temperature for 30 minutes, then place in the freezer for at least 4 hours. Add chocolate chip eyes and nose to each Peep.